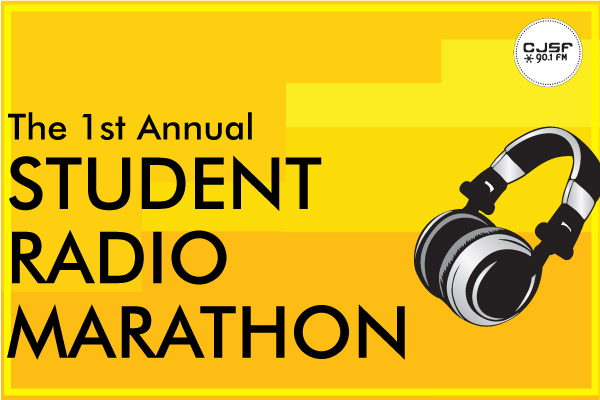 The first annual Student Radio Marathon is upon us! Tune in February 28 from 10am to 8pm for a full day of diverse, student-led programming on CJSF 90.1 FM, including news on student clubs and events and eclectic music mixes. Get connected with what's up at SFU: listen to the Student Radio Marathon over the air and online or drop by the station at TC-216 in the Rotunda on Burnaby campus. Interested in filling an open slot today? Ask our Programming Coordinator Robin Eriksson about it while you're at the CJSF studios! Want to do more stuff with us after the Marathon? Visit our volunteer info page (link) to find out how you can get involved with CJSF as a new volunteer.